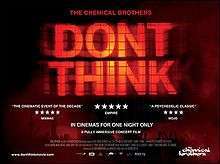 Don't Think is a 2012 live album and concert film of The Chemical Brothers when they performed at the Fuji Rock Festival the previous year. ↑ Nate Patrin (27 March 2012). "The Chemical Brothers: Don't Think". Pitchfork Media. Retrieved 26 July 2012.